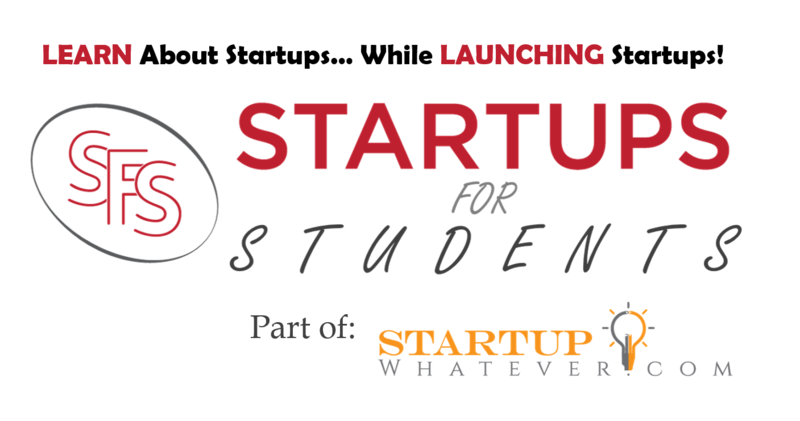 LEARN About Startups… While LAUNCHING Startups! “Startups For Students” is one of many programs run by StartupWhatever.com, based on ReThinkingStartups.com Thoughts & Theories. We run part-time sessions year-round, and full-time sessions in conjunction with students’ academic break schedules — Summer Break (~3 months), Winter Break (~3 weeks). “Startups For Students” participants will work from a combination of Atlanta-based startup hubs (potentially to include: Atlanta Tech Village, Switchyards Downtown Club, Ponce City Market, and others). Exact locations for each session will be announced but all will be in Atlanta and accessible via public transportation (so a car is not required). 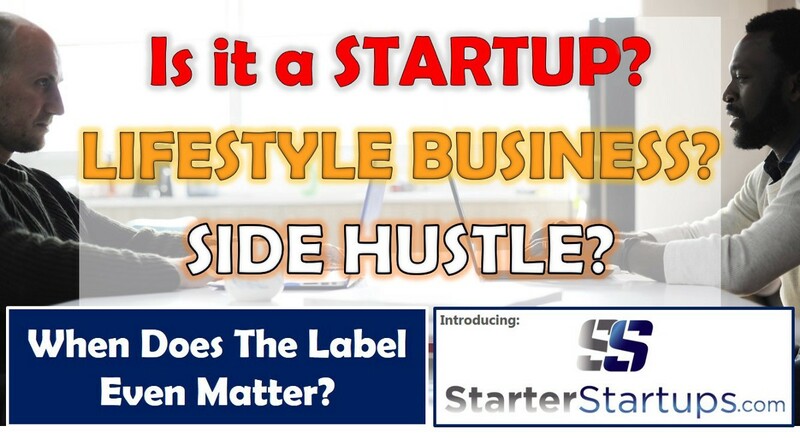 *Spoiler Alert: We believe there are many problems stemming indirectly from certain words and definitions (What IS a Startup? an Entrepreneur? Please, ask 5 different people what their definitions of those two words and let me know how many different responses you receive!) So, SalesLoft and Calendly are startups? And all the pre-revenue companies that pitch each month at ATV and Switchyards are also startups?!? Individually and/or in Teams, Select which “Starter Startups” you will work on (via draft format) and actually share in REAL PROFITS from the projects in your startup portfolio! Collaborate with other program participants, but also compete against each other for additional profits and prizes (based on criteria such as: product sales, ad revenue, web traffic, social media engagement, etc.). At the conclusion of the program, all participants are given the opportunity to negotiate for continued/ongoing participation (profit-sharing and/or real ownership/equity if venture is spun off into separate LLC) for any venture you feel you can provide ongoing value! OUR HOPE IS TO FIND SOME LONG-TERM PARTNERS AND CO-FOUNDERS! * Note: “Profits” are defined as revenue minus expenses, accrual-based accounting, for duration of program, AND for 30 days after program concludes. Regarding the goals of the program, our background, philosophies, etc. 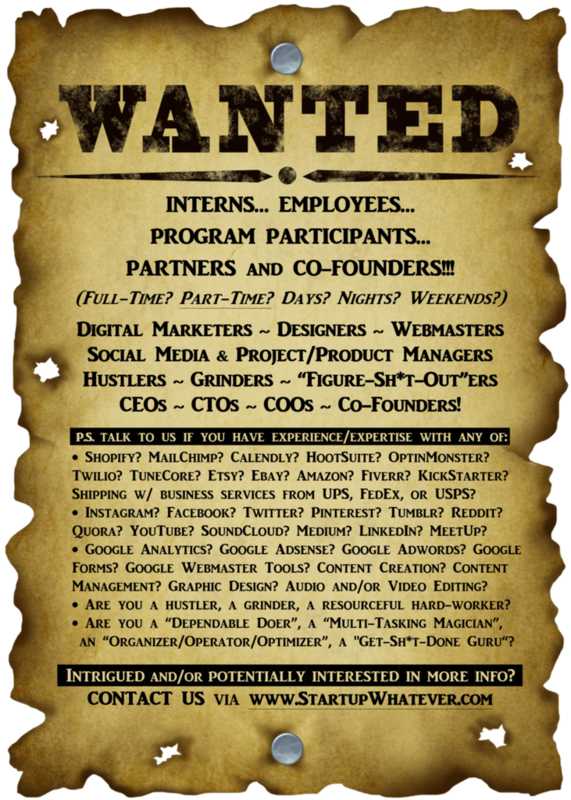 See how well you work with potential FUTURE partners, co-founders, employees, etc. All of the above without quitting your day job (or while you’re still a student! ), without risking a lot of money (yours or investors’), without wasting a lot of time, etc. 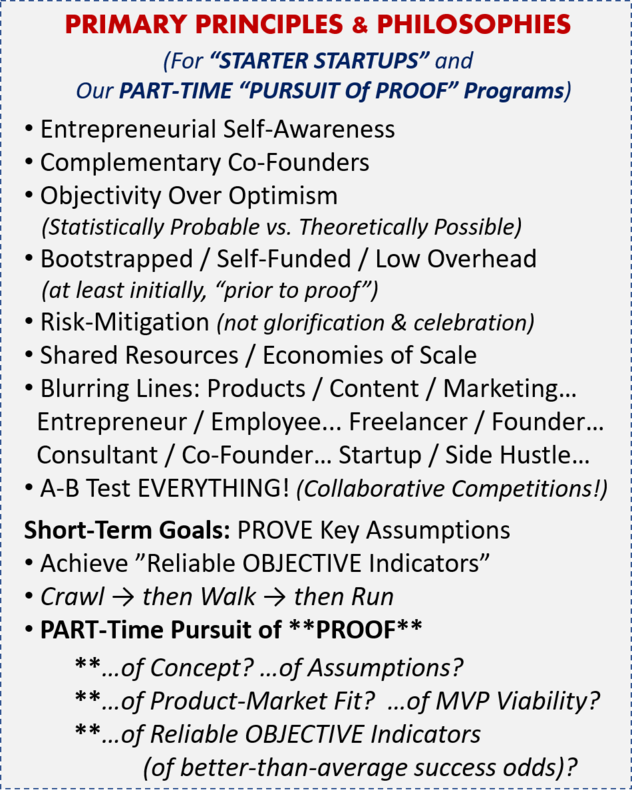 Entrepreneurial Epiphanies & Lessons Learned + Thoughts & Theories Pertaining to Problems & Pitfalls + Innovative Improvement Initiatives → → 19 “STARTER STARTUPS” IN 2019?! 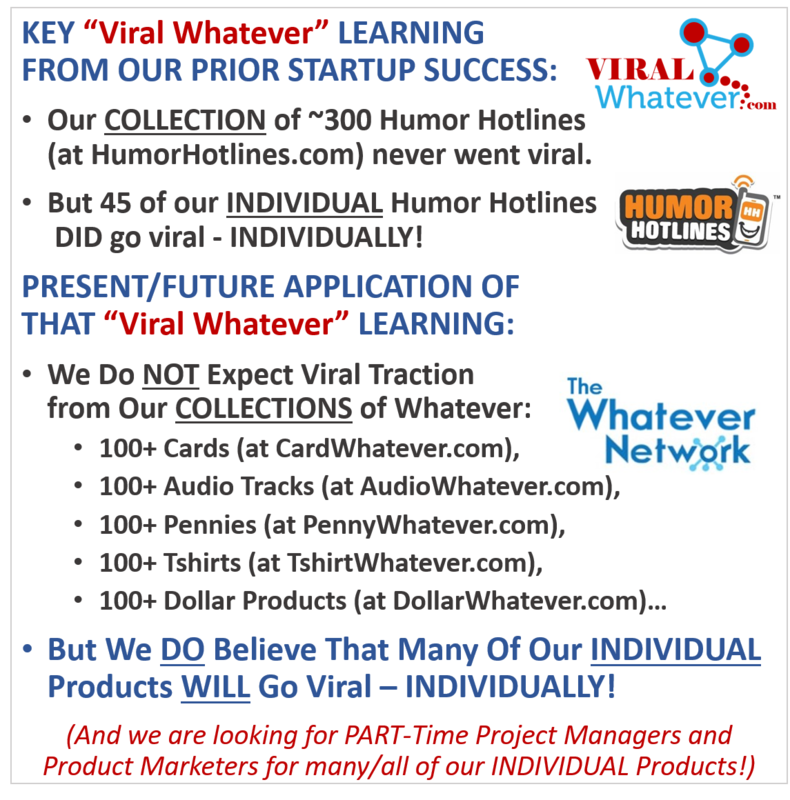 (Pitching for PART-TIME Partners!) - P.S. Talk to us if you're interested/intrigued by ANY of our stuff!